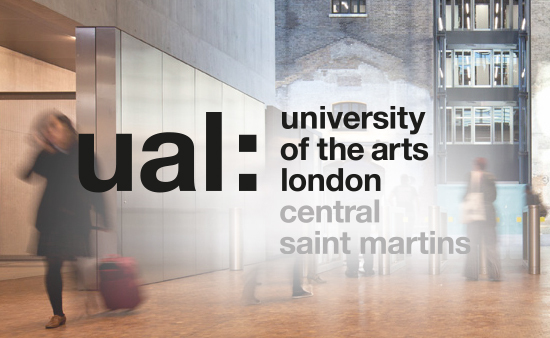 Here we feature the second in a series of short interviews with designers from the Central Saint Martins Jewellery 2015 show and pearls at CSM, including in this article – Hye Ri Kim, Lucy Parker and Ellie Castillo Siu. For the third year, we have been working with the students designers of the Central Saint Martins Jewellery Design course. We will be awarding a Winterson Prize to one of the students for ‘The Best Use of Pearls’ at Jewellery Awards Evening on 25th June. Read about some of the other designers here in Part I and Part III of this series and the Winner of the Winterson Prize 2015. I was born and raised in Korea. I received a Bachelor's degree in Fine Art a few years ago. 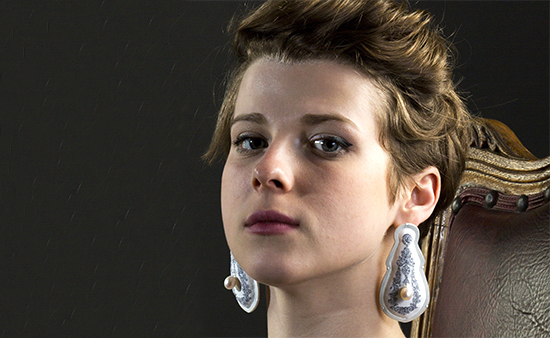 After graduating, I desired to make objects that can be worn on the body so I decided to study jewellery design at CSM. My collection is inspired from Victorian Mourning jewellery. The meaning of mourning jewellery is not only to keep the memory and commemorate the death of a loved one but also to remind the wearer of mortality. 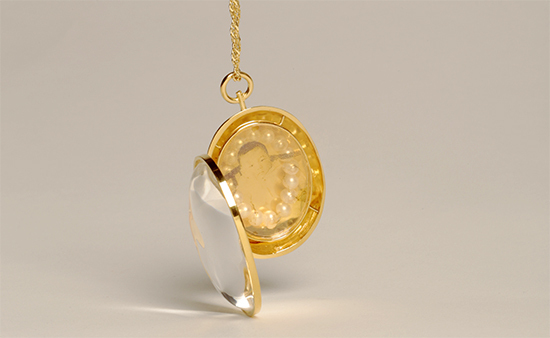 A locket is considered as a memory keepsakes and the belt/buckle motif represents eternity and memory forever. It also represents secure the bond of life between the deceased and the bereaved. With these motives, in my collection I want to reinterpret mourning jewellery in a modern way. As my inspiration is mourning jewellery, the pearl has been considered as tear drops that are perfect for this. 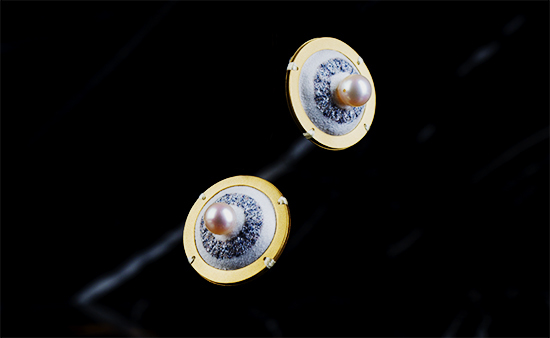 Also the pearl has a very natural and traditional beauty that has been consistently loved over the years. Throughout the collection, I have combined traditional design and material with modern techniques. I love David Hockney’s work. Particularly, his photo collages give me lots of inspiration. During my studies at CSM, I realised that I would like to research more about jewellery, so I decide to study further in London. But my ultimate goal is having my own brand. I expect everyone should love my pieces. But this collection, I could imagine being worn by people who keep their memory in a small piece of jewellery. In my opinion, time and personality makes jewellery classic. Studying at Central Saint Martins for the past 3 years has given me the chance to discover the type of jewellery designer I am and where my interests lay. I have always been curious as to why there are stereotypes, either through the way someone behaves or what they choose to wear, and how this can put someone into a group, similarly how can an object or piece of jewellery become a symbol or an icon. I like to challenge these stereotypes and beliefs through my jewellery. Using humour or romance as a guise to transform a stigma around the topic in hand. My concept stemmed from my fascination with the class system in Britain. I started to notice the many different types of people living in the same place, and the subtle harmony amongst these people, regardless of class and status. Most of my interest lay in the working class and the ‘underclass’, which is the unemployed part of the population also labelled as ‘Chavs’. By watching documentaries and films such as; Fish Tank, Skint, All in the Best Possible Taste and reading different texts and theories for example the book ‘Chavs’ by Owen Jones, I noticed a romanticism to this class, the sweet, sentimental side to the class that are still mourning the loss of industry in Britain. The empty, desolate feelings they have replicate those of the working class when Thatcher was in power, feelings that being part of the working class wasn’t good enough, as if history is repeating itself. I used pearls as a medium to express the feeling of preciousness, luxury and wealth that is seen amongst the middle and upper class. I discovered what pearls mean symbolically, and what they can say about the person wearing them and how certain types of pearl jewellery have become icons. For example I used the symbol of the hoodie and the hoop earring to interrupt the classic pearl necklace or drop pearl earring, to mirror the harmony I noticed amongst different people living in the same place. I would like to work for an established jewellery designer and eventually become an independent jewellery designer and potentially teach jewellery to university level students or higher. Most of my pieces are unisex, they are all quite different from one another. The Hood is more of a statement or catwalk piece, or maybe used as part of a photoshoot for an editorial. 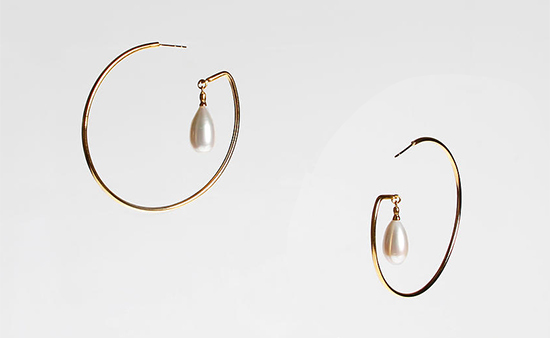 The pearl chokers and earrings are more versatile and wearable. I wouldn’t like to restrict who could wear my jewellery, but I would imagine someone who is either a creative or someone looking to make a statement with their jewellery, a fashion blogger or stylist with a unique style. I think it would be time, it would mean that the piece of jewellery is still being produced or worn 20 years later and maybe it is redesigned many times with different variations of stones or materials but the shape or idea remains the same. View more of Lucy's work here. Despite the often polished and refined tone that is in the final outcome of my work, the combination of materials that I use are somewhat unconventional. I really enjoy the transforming of materials from something non-precious to precise. Influenced by my Chinese and international background, I tend to create pieces that merges different cultures together. One of the contemporary jewellery piece that most influenced my collection was Otto Künzli’s ‘Gold Makes Blind’. The piece questions the way we associate value to substance like gold by concealing the ‘precious’ material underneath a blanket of the ‘non-precious’ rubber. Fundamentally, Künzli is setting two kinds of value that opposes each other. One being the value of ‘precious’ materials, which encompasses conventional jewellery, and another being the value of artistic expression and the conceptual idea behind the work, which underpins the value of contemporary jewellery. In turns, one can no longer judge which is the more important or precious. I was very inspired by his way of questioning material value and the value of artistic expression, whether one is more important than the other. This in turns made me question our perceived value of materials which ultimately started this collection. I intend to juxtapose ‘precious’ and ‘non-precious’ materials in the hope to invert their ‘material hierarchy’. So that materials that are regarded as non-precious can be put together with precious materials as equals. So that ‘precious’ materials like silver and ‘non-precious’ materials like threads can be valued solely by their aesthetic qualities and not their material value. I decided to use needle and threads to embroider Queen Elizabeth II's jewellery, as they epitomise the apex of luxury jewellery. 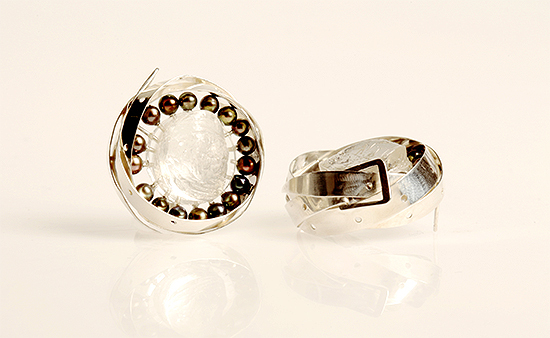 Using pearls made me realize the elegant and lustrous quality that the gem adds to my pieces. The addition of pearls not only adds depth and beauty to my piece, it also lifts my 2 dimensional embroidery to life, by juxtaposing the 2 dimensional embroidery with the 3 dimensional pearls. One of my all time favorite designer is Shaun Leane, I really admire his way of transforming the female silhouette into something fiery and untouchable. The sharp refined edges with the compliment of pearls in his work really intrigues me. In addition his use of unconventional material with precious material is also one of the reasons I was attracted to his work. I have been awarded a G.I.A scholarship to study a ‘Graduate Geologist Course’ in Hong Kong for six months. Upon receiving my bachelor’s degree I will start my G.I.A course immediately. As I mentioned, in the beginning of my collection I always imagined for Her Majesty The Queen to wear my jewellery, as the pieces are indeed an imitation of her personal jewellery in embroidery. All of my pieces are, embroidery versions of her actual jewellery pieces. I believe in order for a piece to be considered as a classic, it will definitely involve craftsmanship, quality of material, display a certain elegant aesthetic and be exceptional of its kind.